Noor Elahi, age 29, is a resident at the Afghan refugee camp in Khaki, Mansehra. Being the sole breadwinner, supporting a family of eight members, including his five children, became challenging for Elahi after his father’s death. “I was distressed when my father passed away since I was dependent on him. 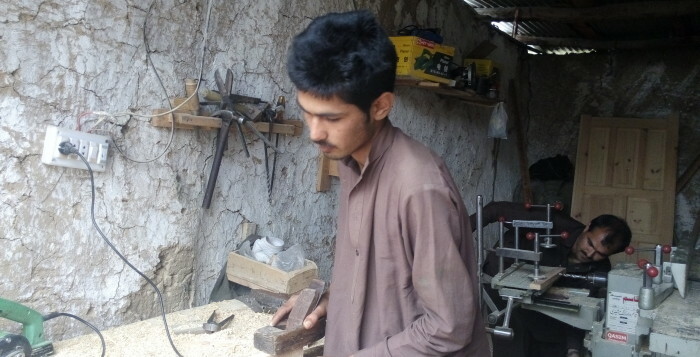 Now I don’t have any other means of income.” Working hard to make ends meet, Elahi began to work as a laborer on daily wages until he was selected as a trainee under the Vocational Training and Market Development Program to learn carpentry skills. Foreseeing a bright future, Elahi enthusiastically participated in a four month training program. To encourage participation, trainees were paid a stipend of PKR.150 per day including lunch and refreshment. Upon successful completion of the training he received a certificate along with a tool kit to practice his learning. In addition, he acquired a job as a partially skilled laborer at a local carpentry shop which further increased his earnings. To build upon his capabilities and learn advanced techniques, Elahi was selected for a one month refresher course. 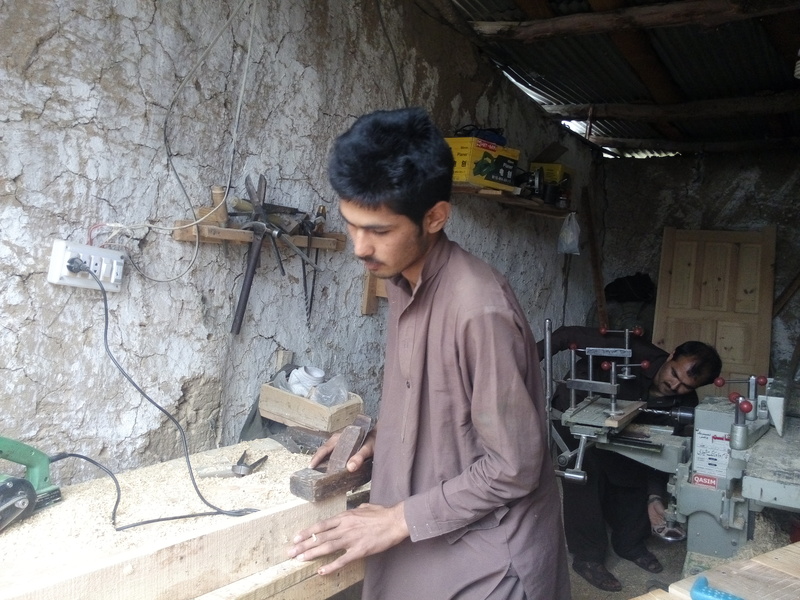 To support the rehabilitation of refugee communities in Pakistan, Community World Service Asia (formerly CWS-P/A) is implementing a Vocational Training and Market Development Project in Mansehra and Haripur as Gifts of the United States Government since 2010. The goal is to enhance self-reliance and increase income for men and women of Afghan Refugees and host community. A four-month program imparts certifiable skills training to men in welding, electrical works, carpentry, auto mechanics, auto electrician, motor cycle mechanic, plumbing and masonry. Women participate in handicraft and dress designing trades in affiliation with Skill Development Council Peshawar. Upon course completion, graduates received a tool kit designed for their respective trades, which enabled them to establish small scale businesses or more easily find employment in Pakistan or Afghanistan.